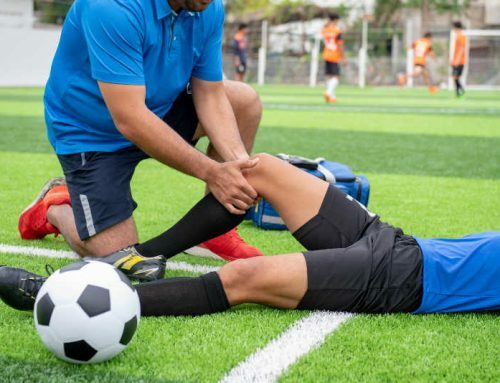 This blog post is an excerpt from Matt Callison’s soon to be released text book, Sports Medicine Acupuncture: An Integrated Approach Combining Sports Medicine and Traditional Chinese Medicine due out Spring of 2019! It was Hua Tuo (110-207 AD), an important physician of the Han dynasty, who insightfully recognized the relationship between the spine, the organs and their associated channels. Hua Tuo discovered a set of acupuncture points, known to practitioners as the Huatuojiaji points, which are distributed on each side of the spine. These points, 48 in total, are located 0.5-1 cun lateral to the lower border of the spinous process of each of the cervical, thoracic and lumbar vertebrae (O’Connor, Bensky 1981). While some references state that the Huatuojiaji points start at the thoracic spine, for the purposes of this book we will consider the Huatuojiaji points to run the entire length of the cervical, thoracic and lumbar spine. 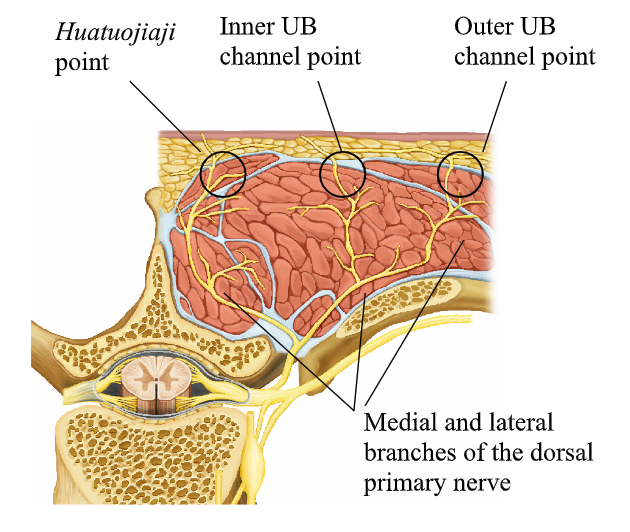 From the perspective of modern anatomy, the Huatuojiaji points are found in the same paraspinal region as the medial branch of the dorsal primary nerve. The lateral branch of this nerve innervates the erector spinae musculature, which are found at the acupuncture points of the inner and outer Urinary Bladder channels on the back (Fig. 1). The Huatuojiaji points, the deep paraspinal muscles, their innervation and the vertebrae they act upon are directly affected by the decline of Kidney qi and jing. The impact of the decline of Kidney energy, which in this case we are defining as Kidney qi and jing, on the bones, joints and ligaments of the body, particularly of the spine, must be understood as the context for assessing and treating musculoskeletal injury in the aging patient. In Western science and TCM theory, there is an understanding that the onset of aging begins in the 30+ age group. The decline of Kidney qi and jing and its effect on the bones and joints of the vertebral column is observed in TCM as pathology of the Du Mai. As both Kidney qi and jing decline, there is often a corresponding loss in the intervertebral disc height. Kidney yin, a component of jing, is responsible for nourishing the intervertebral discs and keeping the nucleus pulposus, a ye fluid, healthy so that it can maintain its function of shock absorption. The Du Mai begins in the Kidneys and its pathway traverses the vertebral column. The Du Mai is responsible for the circulation of nutritive qi and protective qi, which the decline of Kidney qi and jing, is seemingly proportional to the degree of deficiency within this Extraordinary vessel. This energetic decline impacts the Du Mai’s ability to circulate ying and wei qi, which decreases the amount available to the body and can create organ pathology and musculoskeletal injury. The Western parallel to the energetic decline is evident in normal spinal degeneration or spondylosis, which is characterized by a decrease in nerve output and energy to all of the innervated tissue. 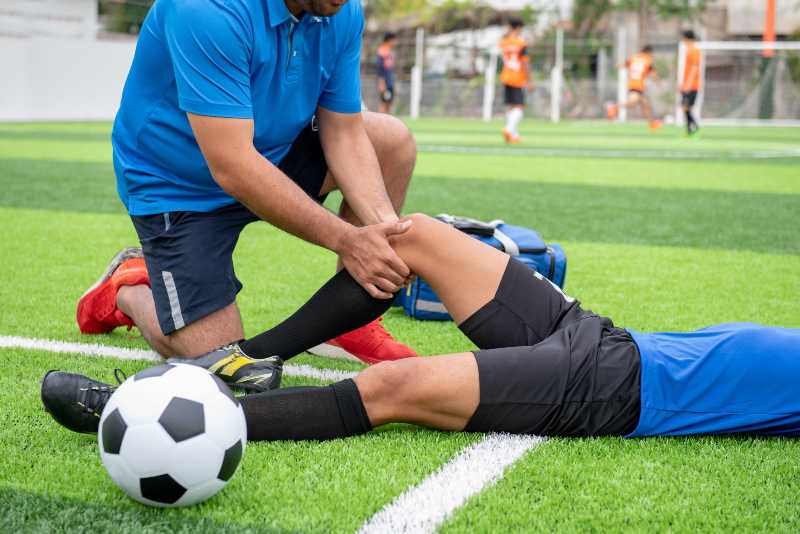 Spondylosis is a term used to describe the normal degenerative changes in the spine and it can vary in severity from mild to severe cases of spinal stenosis and osteoarthritis. Spondylosis results in decreased height of the intervertebral disc, which puts additional pressure on the facet joints and narrows the intervertebral foramen where the spinal nerve exits. Under normal conditions, the dorsal primary rami nerve has enough unobstructed space through the neural foramen to supply its innervated tissue with the appropriate amount of efferent signals needed to regulate and maintain motor response and cellular function. Spondylosis can cause compression of the nerve roots as they exit the spinal cord and it is a common finding in recurrent zang fu pathologies and musculoskeletal injuries. Muscles react to the inadequate neural stimulus of spondylosis by becoming fibrotic and shortened. 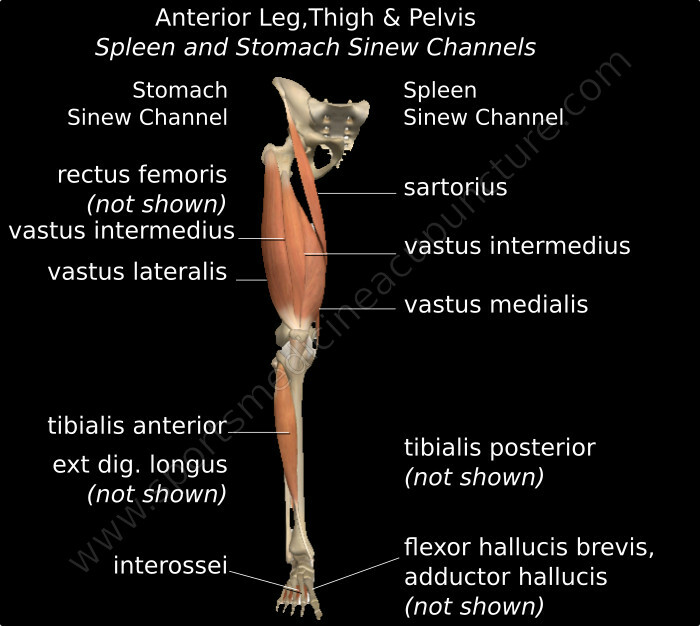 Muscle shortening is of particular importance when it affects the deep paraspinal muscles, which connect the vertebrae above and below and are innervated by the medial branch of the dorsal primary nerve. As these paraspinal muscles shorten from inadequate neural stimulation, they pull the adjacent vertebrae together, which results in increased pressure on the nerve root (Gunn, 2000). The increased pressure on the nerve root perpetuates spondylosis, which in turn leads to a decrease in the flow of efferent stimulus and communication to the organs and musculoskeletal structures that are associated with that particular nerve and spinal segment. The Huatuojiaji points are motor points of the deep paraspinal musculature such as the rotatores brevis, longus and multifidus. Because of the relationship between the deep paraspinal muscles, their innervation and their effect on the vertebrae, the Huatuojiaji points are critical to use in all cases of organ-related pathologies and musculoskeletal injury that is caused by spondylosis. The Huatuojiaji points will exhibit excess and deficient qualities, which can be assessed through palpation and which will predicate the appropriate needle technique for the best results. When palpating the Huatuojiaji points in a patient with spondylosis or with chronic zang fu pathology, the practitioner will usually find one of the three different conditions that are described here. Both left and right Huatuojiaji points will feel tight and rigid due to hypertonic paraspinal muscles, which indicates an excess condition. One Huatuojiaji point will feel tight and rigid (excess—shi) and the opposite Huatuojiaji point will feel relatively soft and pliable due to hypotonic paraspinal muscles, which reflects a deficient (xu) condition. There is qi edema present at both Huatuojiaji points. Qi edema, or qi zhong, is a palpable and observable sign that indicates the presence of spondylosis. It is a common finding around the lower cervical and lower lumbar vertebrae. Spondylosis affects the dorsal primary nerve, and, in turn, the autonomic nervous system, which leads to vasoconstriction and altered cellular metabolism. The end result of these effects is cooler skin temperature and fluid accumulation in the local tissues, or trophedema. In TCM, localized trophedema from spondylosis is known as qi edema and it is caused by underlying qi and blood stagnation that interferes with the normal fluid pathways within the channels and collaterals. The Huatuojiaji points are perceptibly cooler in the presence of qi edema as a result of the decreased blood circulation. To assess for qi zhong, the practitioner firmly palpates with one finger on each Huatuojiaji point and observes if a depression is present. An indentation in the cutaneous tissue after the finger pressure has been released is a sign of qi edema (Fig. 2 A and B). The degree of qi edema can vary and in mild cases of spondylosis, the indentation may not be obvious but the tissues at the Huatuojiaji points and the Du Mai may feel spongy. The amount of swelling in the tissues will usually correspond to the severity of the spinal degeneration and the amount of qi and blood stagnation at the spine. Figure 2A. Palpation of Qi edema. Figure 2B. Sign of Qi edema. The central aspect of the deep paraspinal muscles, where the motor points of the multifidi and spinalis thoracis are located, is found 0.5-1 cun lateral to and level with the lower border of the associated vertebral spinous processes. These motor points occupy the defined location of the Huatuojiaji points and they link the anterior and posterior primary divisions of the nerve pathways. The depth of needle insertion and needle technique are based on the determination of excess and deficient conditions at the Huatuojiaji points. When needling the Huatuojiaji points in the thoracic region, the practitioner must ensure that the point location is accurate and kept 0.5 cun away from the tip of the vertebral spinous process. If the Huatuojiaji points are located too far laterally in the thoracic region, the needle can penetrate the pleural cavity and cause a pneumothorax. Figure 4. Excess needling depths at the Huatuojiaji points. 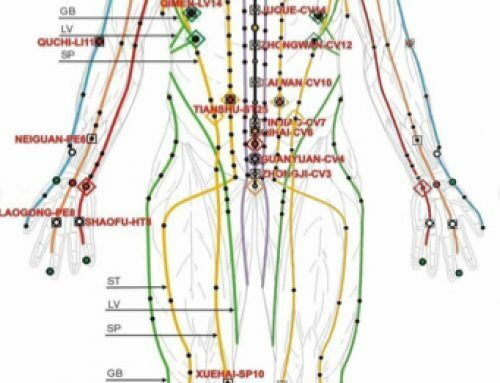 Because of the significance of the Huatuojiaji points in treating zang fu and musculoskeletal related conditions, there are some special guidelines to consider when needling these points. The following section discusses the needle techniques that should be used to most effectively stimulate the Huatuojiaji points that is based on the condition. This occurs when one Huatuojiaji point is determined to be excess and the opposite Huatuojiaji point is found to be deficient. The needle will be inserted deeply into the excess side with a xie fa technique and superficially on the deficient side with a bu fa technique (Fig. 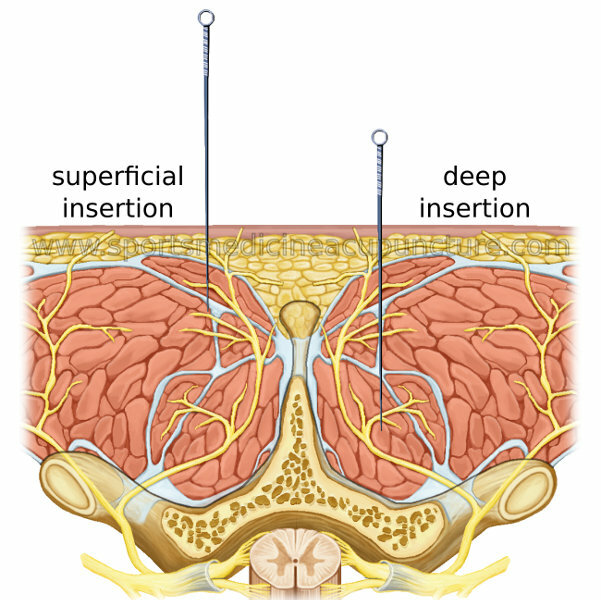 3).Recommended Depth of Insertion: Cervical and Thoracic Regions—Needle depth on the excess side 1-1.25 inches. Needle depth on the deficient side 0.25 inch. Lumbar Region—Needle depth on the excess side 1.5-2.5 inches. Needle depth on the deficient side 0.25-0.5 inch. When both Huatuojiaji points are excess, the needle will be inserted deep into both points with a xie fa technique (Fig. 4).Recommended Depth of Insertion:Cervical and Thoracic Regions—Needle depth on both sides 1-1.25 inches. Lumbar Region—Needle depth on both sides 1.5-2.5 inches. When qi edema is present at the Huatuojiaji points, the needle will be inserted deeply into both sides with a xie fa technique. Direct or indirect moxibustion is used to help warm the area and move the stagnated fluid (Fig. 5). 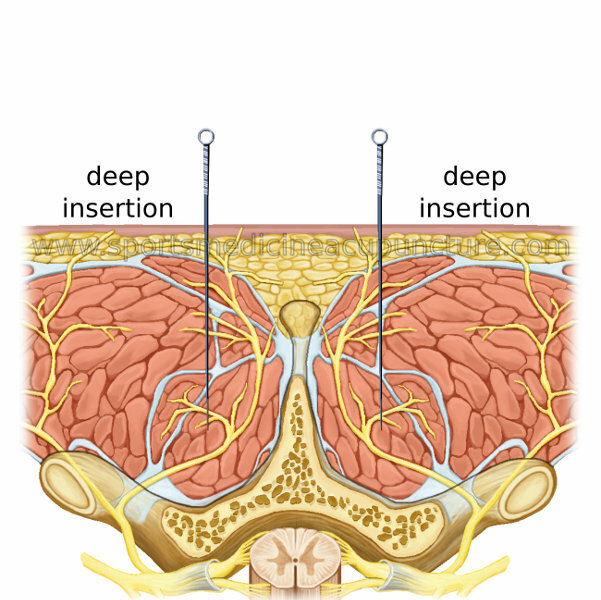 Recommended Depth of Insertion:Cervical and Thoracic Regions—Needle depth on both sides 1-1.25 inches. Use with direct or indirect moxibustion. Lumbar Region—Needle depth on both sides 1.5-2.5 inches. Use with direct or indirect moxibustion. For more information on using the Huatuojiaji Points with various treatment methods e.g. The Hua Tuo Arc, Huatuojiaji Points and Myotomal Motor Points and Yin Yang Therapy, register for courses in the Sports Medicine Acupuncture Certification (SMAC) Program. 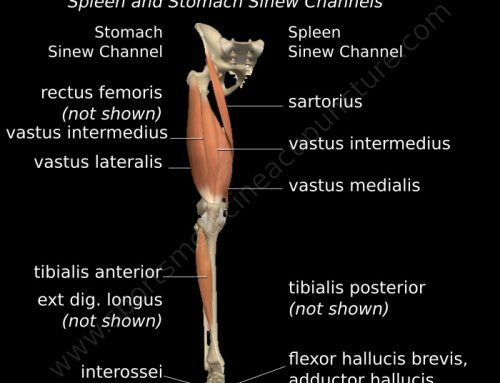 Also, check out Instructor Brian Lau’s blog on the Anatomy of the Sinew Channels for more great information that is taught in the SMAC Program. Notes from Chan Gunn’s lecture at the Fifth North American Symposium on Acupuncture Seminar 4. San Francisco, Ca 7/2000. O’Connor J, Bensky D. Acupuncture: A Comprehensive Text. Shanghai College of Traditional Medicine. Seattle, WA: Eastland Press; 1981. An outstanding article and a fantastic cadaver video! Thanks so much for sharing Matt and Brian. Great blog. Thank you for all you contribute to the field of orthopedic acupuncture.